Dual antiplatelet therapy (DAPT) with aspirin and a P2Y12 inhibitor is usually administered for 6-12 months after percutaneous coronary intervention (PCI) and stent placement to prevent stent thrombosis. The appropriate duration of this therapy, however, is controversial as trials comparing different durations of DAPT following PCI have shown conflicting results. There are two important issues related to DAPT after stent implantation: a) How to best prevent in-stent thrombosis and b) Prevention of native coronary disease progression. Regarding stent thrombosis, which will be the focus of this brief note, and given the bleeding potential of DAPT, the aim is to establish the minimum duration of treatment required to prevent stent thrombosis and recurrence of events. This is a rapidly moving field and the development of newer drug-eluting stents (DES) which appear to be associated with a lower risk of early and late stent thrombosis1-4 represent an important variable in this equation. Major trials, ISAR-SAFE5 and ITALIC6 found no differences in ischemic events or bleeding risk when 6-month treatment and longer durations i.e.12 and 24 months, were compared. Both these trials included large numbers of patients receiving treatment with third-generation DES and a large proportion were at a relatively low risk of events. Both trials were stopped early because of recruitment issues and low event rates. The results of these studies suggest that DAPT can be safely stopped at 6 months in patients at high risk of bleeding or if required because of intercurrent condition needing surgery. The Dual Antiplatelet Therapy (DAPT) study7, with almost 10,000 patients, was probably the only one truly powered to give a definitive answer regarding this important clinical issue. DAPT compared 12 months vs 30 months of thienopyridine therapy (clopidogrel or prasugrel) added onto aspirin, in patients who were not at high risk of developing ischemic or bleeding events (but higher risk than patients in the above mentioned trials). 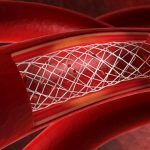 The DAPT results showed that longer term treatment with DAPT reduced the risk of stent thrombosis and myocardial infarction (both related and unrelated to stent thrombosis), with an associated increase in moderate bleeding. Of particular interest, ischemic event rates increased markedly in the 3-month period after discontinuation of the thienopyridine treatment, regardless of when that took place. This finding may suggest that DAPT treatment should be given for as long as possible – (even for life). Should we therefore conclude, considering the DAPT trial results, that patients should not come off DAPT when there is a risk of atherosclerotic disease progression and no increased bleeding risk? 1.-Palmerini T, Biondi-Zoccai G, Della Riva D, et al. Clinical outcomes with bioabsorbable polymer versus durable polymer-based drug-eluting and bare-metal stents: evidence from a comprehensive network metaanalysis. J Am Coll Cardiol. 2014;63:299-307. 2.- Baber U, Mehran R, Sharma SK, et al. Impact of the everolimus-eluting stent on stent thrombosis: a metaanalysis of 13 randomized trials. J Am Coll Cardiol. 2011;58:1569-77. 3.- Camenzind E, Wijns W, Mauri L, et al. Stent thrombosis and major clinical events at 3 years after zotarolimus-eluting or sirolimus-eluting coronary stent implantation: a randomised, multicentre, open-label, controlled trial. Lancet. 2012;380:1396-405. 5.- Schulz-Schüpke S, Byrne RA, Ten Berg JM, Neumann FJ, Han Y, Adriaenssens T, et al; Intracoronary Stenting and Antithrombotic Regimen: Safety And EFficacy of 6 Months Dual Antiplatelet Therapy After Drug-Eluting Stenting (ISAR-SAFE) Trial Investigators. ISAR-SAFE: a randomized, double-blind, placebo-controlled trial of 6 vs. 12 months of clopidogrel therapy after drug-eluting stenting. Eur Heart J. 2015;36(20):1252-63. 6.- Gilard M, Barragan P, Noryani AAL, et al. 6- versus 24-month dual antiplatelet therapy after implantation of drug-eluting stents in patients nonresistant to aspirin: the randomized, multicenter ITALIC trial. J Am Coll Cardiol. 2015;65:777-786. 7.- Mauri L, Kereiakes DJ, Yeh RW, et al. Twelve or 30 months of dual antiplatelet therapy after drug-eluting stents. N Engl J Med. 2014;371:2155-2166. The optimal duration of dual antiplatelet therapy (DAPT) after coronary stent implantation remains uncertain. It is influenced by the clinical profile of the patient, stability of coronary disease at presentation, and type of stent used. The trials discussed in the article provide apparently conflicting, but ultimately meaningful data. The US and European guidelines now provide a Class I recommendation for a shorter duration (6 months) of DAPT for drug eluting stents in stable (low risk for ischaemic events) patients. Both sets of guidelines recommend 12 months of therapy (Class I) in patients with acute coronary syndrome; with a Class II recommendation for DAPT beyond this period. An individualised approach is needed for selecting those to be treated beyond 12 months. Some interventionists have used a longer duration of DAPT for patients with left main or bifurcation stenting, suboptimal stent deployment, and patients experiencing stent thrombosis. Recently, the DAPT score has been proposed to identify patients benefiting from a longer duration of therapy. The score predicts the combined ischemic and bleeding risks using clinical factors such as age, diabetes, smoking within the last two years, prior MI or PCI, history of heart failure or left ventricular ejection fraction <30 percent, MI at presentation, stenting of a vein graft, type of stent, and stent diameter <3 mm. Based on DAPT trial data, patients with a score of ≥2 may benefit from an additional 18 months of treatment. Our practice is likely to continue to evolve with the introduction of new stents. For example, the availability of the BioFreedom™ stent now provides the option of 1 month of DAPT in the estimated 20% of patients who are at high bleeding risk . Dual anti-platelet therapy (DAPT) is routinely commenced in patients who have undergone percutaneous coronary intervention (PCI), involving both drug-eluting and bare-metal stents, with the aim of reducing the risk of subsequent in-stent thrombosis. Although the introduction of drug-eluting stents has markedly decreased the occurrence of re-stenosis, in-stent thrombosis remains a significant complication. The presence of a foreign body within the coronary artery induces platelet adhesion and activation, and potentially thrombus formation, until a layer of endothelial cells has covered the surface of the stent. Current guidelines recommend that dual anti-platelet therapy should be continued for between 6 and 12 months post stent-insertion [1, 2]. Meta-analysis data have generally supported the use of short term DAPT (<12 months) regimes, in view of the reduced bleeding rates without an apparent increase in ischaemic complications [3-5]. It is likely that these recommendations will soon be reviewed, following the recent publication of results from the Dual Antiplatelet Therapy (DAPT) Study, a large-scale randomised controlled trial, showing that the continuation of DAPT beyond 12 months post-PCI with drug-eluting stent placement yielded a reduction in the occurrence of in-stent thrombosis, although there was an increased bleeding risk . This data has since facilitated the development of a prediction score to enable clinicians to identify patients who are likely to receive greater benefit from continuing DAPT after 12 months, based on bleeding and ischaemic risk factors, although this has yet to be fully validated . Although a clear consensus on the optimal duration of DAPT post-PCI insertion may take some time to reach, a pragmatic approach at present is for clinicians to continue adhering to the national guidelines, whilst considering the bleeding and ischaemic risks of their individual patient and adjusting the recommended DAPT duration accordingly. Authors/Task Force, m., et al., 2014 ESC/EACTS Guidelines on myocardial revascularization: The Task Force on Myocardial Revascularization of the European Society of Cardiology (ESC) and the European Association for Cardio-Thoracic Surgery (EACTS)Developed with the special contribution of the European Association of Percutaneous Cardiovascular Interventions (EAPCI). Eur Heart J, 2014. 35(37): p. 2541-619. Navarese, E.P., et al., Optimal duration of dual antiplatelet therapy after percutaneous coronary intervention with drug eluting stents: meta-analysis of randomised controlled trials. BMJ, 2015. 350: p. h1618. Cassese, S., et al., Clinical impact of extended dual antiplatelet therapy after percutaneous coronary interventions in the drug-eluting stent era: a meta-analysis of randomized trials. Eur Heart J, 2012. 33(24): p. 3078-87. Bang, V.V. and M.S. Levy, Duration of dual anti-platelet therapy following drug eluting stents: Less Is More? Catheter Cardiovasc Interv, 2016. 87(4): p. 733-4. Mauri, L., et al., Twelve or 30 months of dual antiplatelet therapy after drug-eluting stents. N Engl J Med, 2014. 371(23): p. 2155-66. Yeh, R.W., et al., Development and Validation of a Prediction Rule for Benefit and Harm of Dual Antiplatelet Therapy Beyond 1 Year After Percutaneous Coronary Intervention. JAMA, 2016. 315(16): p. 1735-49.